Lana Veenker is a casting director. She looks for people to fill roles in major motion pictures shot in the Northwest. 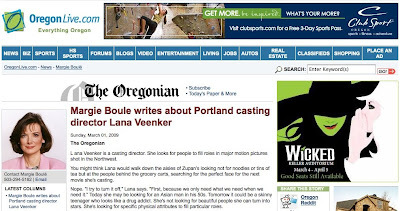 You might think Lana would walk down the aisles of Zupan’s looking not for noodles or tins of tea but at the people behind the grocery carts, searching for the perfect face for the next movie she’s casting. Nope. “I try to turn it off,” Lana says. “First, because we only need what we need when we need it.” Today she may be looking for an Asian man in his 50s. Tomorrow it could be a skinny teenager who looks like a drug addict. She’s not looking for beautiful people she can turn into stars. She’s looking for specific physical attributes to fill particular roles.